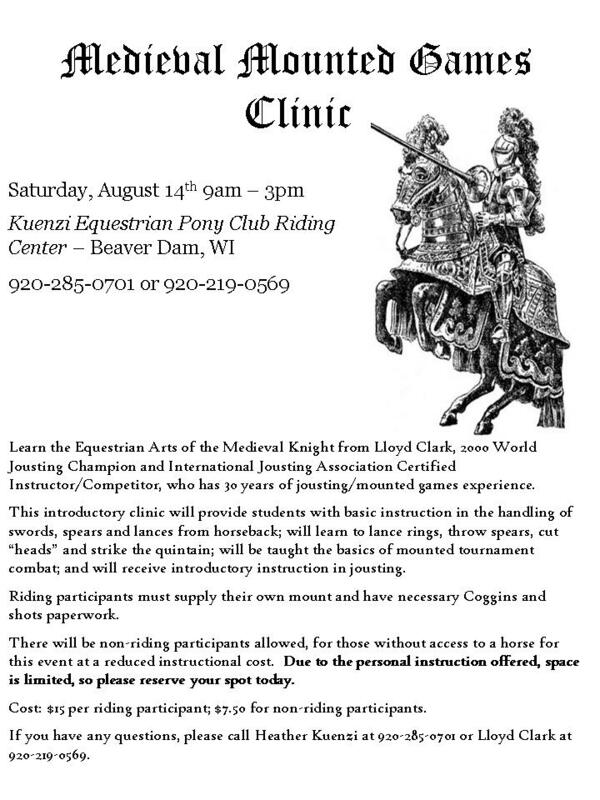 I will be holding classes on beginning jousting and medieval mounted skill-at-arms beginning in August in Beaver Dam, Wisconsin. We will begin by holding a mounted skill-at-arms clinic at the stables in early August and, depending upon the turnout and interest, will be setting up regular class schedules following the clinic. I will be following a cirricula that I developed following International Jousting Association guidelines. As of right now, we don't have a definite date or cost to attend. I am working that out with the owner of the stables as well as determining which horses could be rented for the clinic. Do you have a website with more information? If not, please post here when more info comes available. This would be just up the road a bit from the Chicago area and sounds very interesting. What are you thinking the riding experience should be to participate? Myself and at least one other (perhaps two) are also interested to hear more on this. I think it is a great idea however there are some serious drawbacks one shoudl consider. First and foremost is the cost of owning (not buying a horse). As a horse owner I can tell you that unless you own your own land and can build your own stable the cost of a horse is prohibitive just from the cost of feeding ans stabling. Agood horse will cost you $3,000 up but the cost of care will run about $6,000 per year at $500 per month and that is cheap not counting vet bills. You had better have deep pockets to pay for hospital expenses as well. Ever come off the back of a horse? Personally I suffered a punctured lung from a broken rib from a fall at full gallop on a horse (the cinch strap broke). This is only just something to think about. Agood horse will cost you $3,000 up but the cost of care will run about $6,000 per year at $500 per month and that is cheap not counting vet bills. What constitutes a "good" horse is quite subjective. I have worked with many, and something I can say is that cost and worth are often not representative of one another. Upkeep expenses also vary wildly around the country. Honestly though, I think this irrelevant to the topic at hand, which concerns classes, the participation in which persons might be interested in for any number of reasons. You had better have deep pockets to pay for hospital expenses as well. Ever come off the back of a horse? Well, if you want to pay for a plane ticket - I could be convinced to come over and give a clinic or two near you! I am interested in this clinic. I have a horse who I do hunter/jumper with but we have never done anything like this before. Can we try? Of course! Just call ahead of time to reserve a slot. Look forward to meeting you!